These pages, some of which are still being created, will give information on the history of the church, up to the present day, along with other things associated with the church. Some pages will have links to other websites, which may be of interest. Much of the historical detail has been taken from a book about All Saints Church written by Gerald Millard, with his kind permission and we are extremely grateful for his help. We would also like to thank anyone else who may have helped in any way with this section, in particular Tony Thomas for sparing so much of his valuable time. We hope you will find this section interesting and informative. The name Beckingham and that of Walkeringham date from the early Anglo-Saxon migrations and there is evidence of a Romano-British settlement here even before that. The River Trent was an important highway into the country for sea-borne travellers with landing places to be found in the vicinity. It is unclear exactly when religious services were first held in Beckingham and there appears to be no direct documentary evidence of when a church was first built on the site, although there are signs of an ancient foundation. The first indication of Christian activity in the area is given by the Venerable Bede who relates how in A.D. 628, Bishop Paulinus baptised a great number of people in the River Trent in the presence of Edwin, King of Northumbria. It is possible this took place at or near Littleborough where the old Roman road crossed the River Trent in a paved ford. 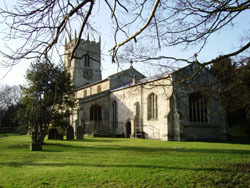 In the Doomesday Book, Beckingham is mentioned twice, one entry describing a holding of the Archbishop of York, but there is no direct reference to a church here. This in itself is not conclusive, as by no means were all churches recorded. 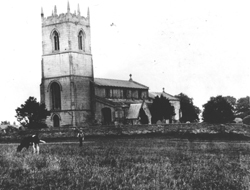 If there was in fact no church in Beckingham at the time, perhaps villagers assembled around a cross where the church now stands, or maybe they walked up the hill to Gringley where there was a church in 1086. Writers vary in their opinions of when the different parts of the church were built, but it is generally accepted that a building existed on the present site in the 12th century, possibly less than 100 years after the Conquest.